All email messages. All email messages received by the user are tracked (will have activities created). Email messages in response to Dynamics 365 for Customer Engagement apps email. Only replies to email messages that have already been tracked will be saved as email activities. This option uses smart matching, a correlation method that uses the existing properties contained in the email to relate email messages to activities. Email messages from Dynamics 365 for Customer Engagement apps Leads, Contacts, and Accounts. Only email messages sent from leads, contacts, and accounts in the Dynamics 365 for Customer Engagement apps database are saved as activities. Email messages from Microsoft Dynamics 365 for Customer Engagement apps records that are email enabled. Email messages are tracked from any record type that contains an email address, including customized record types (entities). By default, the Email messages in response to Dynamics 365 for Customer Engagement apps email option is enabled. Correlation occurs after an email message is filtered. System administrators can turn off all message tracking for a particular user by setting Incoming Email under Synchronization Method to None on the Mailbox form. Email correlation is set on the Email tab of the System Settings page and can be enabled or disabled for the entire Dynamics 365 for Customer Engagement apps organization. Dynamics 365 for Customer Engagement apps uses two kinds of correlation, tracking tokens and smart matching. By default, both correlation types are enabled. 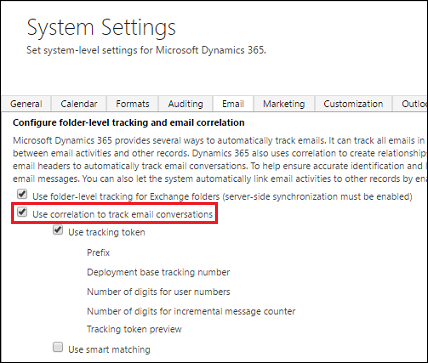 Tracking tokens are the only supported correlation method that can be used when you use Dynamics 365 for Outlook connected to an SMTP server and send email to a non-Exchange recipient. In this situation, if tracking tokens are not enabled, then correlation events, such as the automatically creating records based on the regarding object, may not work. Use Exchange conversations to increase the probability for email identification and matching. Exchange groups together related email and assigns them an id (conversation id), to identify emails that are part of one conversation. Go to Settings > Administration > System Settings. In the Configure folder-level tracking and email correlation area, click Use correlation to track email conversations. If checked, this option uses the conversation id to identify all the emails that replied to a tracked email. In the email To field, all of the Dynamics 365 for Customer Engagement apps records of email-enabled entities with the email address will be listed. Tracking tokens increase the probability for email identification and matching. You can use the tracking token feature to improve email message tracking. A tracking token is an alphanumeric string generated by Dynamics 365 for Customer Engagement apps and appended to the end of an email subject line. It matches email activities with email messages. Tracking tokens add an additional correlation component to smart matching. When Dynamics 365 for Customer Engagement apps generates an outgoing email activity, a resulting email response arriving in the Dynamics 365 for Customer Engagement apps system is then correlated to the originating activity. By default, the tracking token feature is turned on. By default, Dynamics 365 for Customer Engagement apps uses the following token structure, that consists of a 4 character prefix and a 7 digit identifier. The following table lists tracking token parts and descriptions. Prefix Configurable from 1-20 characters. The default value is Dynamics 365 for Customer Engagement:. The prefix can be unique for each organization or Dynamics 365 for Customer Engagement instance. For example, in a multi-tenant deployment of Dynamics 365 for Customer Engagement apps, we recommend that each organization configure and use a unique prefix. Deployment base tracking number Configurable from 0-2,147,483,647. Default value is 0. Can be used as an identifier for a specific instance, organization, or deployment of Dynamics 365 for Customer Engagement apps . User number digit range Configurable from 1-9. The default range is three (3) digits. This value determines how many digits to use when Dynamics 365 for Customer Engagement apps generates the numeric identifier for the Dynamics 365 for Customer Engagement apps user who generated the email activity. Incremental message counter digit range Configurable from 1-9. Default range is three (3) digits. This value determines how many digits to use when Dynamics 365 for Customer Engagement apps generates the numeric identifier for the email activity (not the individual messages that the activity contains). If you use the default value to generate a token with a three-digit number, it will increment the number through 999, and then restart the number at 000. You can use a larger order of digits to reduce the possibility of assigning duplicate tokens to active email threads. In the Configure email correlation area you can disable, enable, or change the default tracking token structure. Subject matching. Prefixes, such as RE: or Re:, and letter case are ignored. For example, email message subjects with Re: hello and Hello would be considered a match. Sender and recipient matching. The system calculates the number of exact sender and recipient email addresses in common. When the matching process is complete, the system selects the owner and the object of the incoming email message. By default, smart matching is turned on. You can disable, enable, and tune smart-matching settings in the System Settings dialog box – Email tab.